Leni Riefenstahl’s classic piece of historical filmmaking, filmed during the 1934 Nazi Party Rally in Nuremberg, Germany, is considered by many to be one of the most important films ever made. Realized by Paul Joseph Goebbels, Hitler’s Reich Minister for Public Enlightenment and Propaganda, this film was created to influence all of Germany to support the “power” of the Nazi Party. 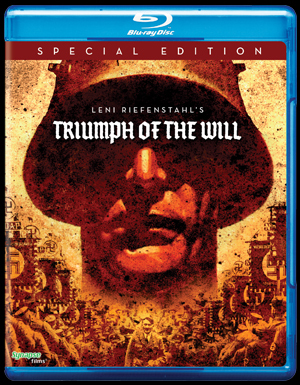 Historically significant and, at times, a horrifyingly manipulative exercise in propaganda for the Nazi regime, TRIUMPH OF THE WILL continues to be controversial eighty years after its original release and has been banned in Germany for many decades. Until her death in 2003, Riefenstahl was under fire for her personal relationship with Adolph Hitler, spending her life haunted by the shadow of the Nazi Party. This all-new remastered version of TRIUMPH OF THE WILL is derived from a new 2K scan, digitally corrected and restored under the supervision of film historian and preservationist, Robert A. Harris with digital restoration performed by Greg Kimble.